Thanks for being patient! Whew! We just dropped my parents, sister and her two kids off at the airport late this morning. 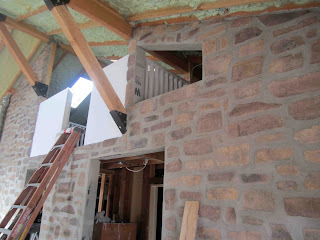 And I had a few minutes after work to blog about our progress. Sorry, I’ve been a bit remiss with posts. We’ve just been having so much fun during my family’s stay. Lego Land, the Science Center and the LA Zoo were among our travels, but it was all of the time back at home, cooking dinner, playing in the pool, watching movies and playing cards (Nertz) together that I loved the best. We are missing them already. I can report that during the past two weeks my husband never really slowed down our house progress, however. Although we had hoped our house would be done by the time my family arrived at the end of July, alas, it was not. But, we are getting close. And, we did finish the bedrooms and bathrooms enough to be useable. At one point, we had 10 people sleeping comfortably in our house. 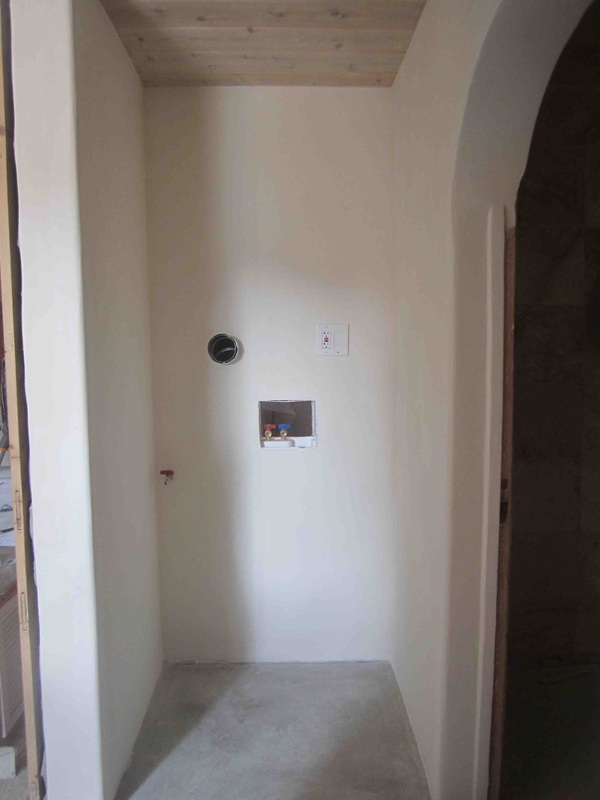 And when everything is completed, with all of our built-ins, we’ll even be able to fit a few more! 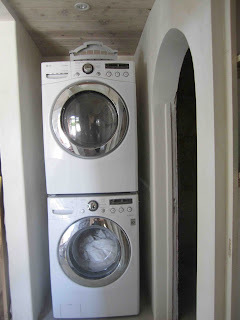 Today’s post is just a quick update on our master closet and laundry nook, which I am loving. See pic above of our closet--although it's hidden behind the partial wall. That cable sticking out is the HDMI cable, which will be used for our new TV, which should be installed next week. Wahoo! 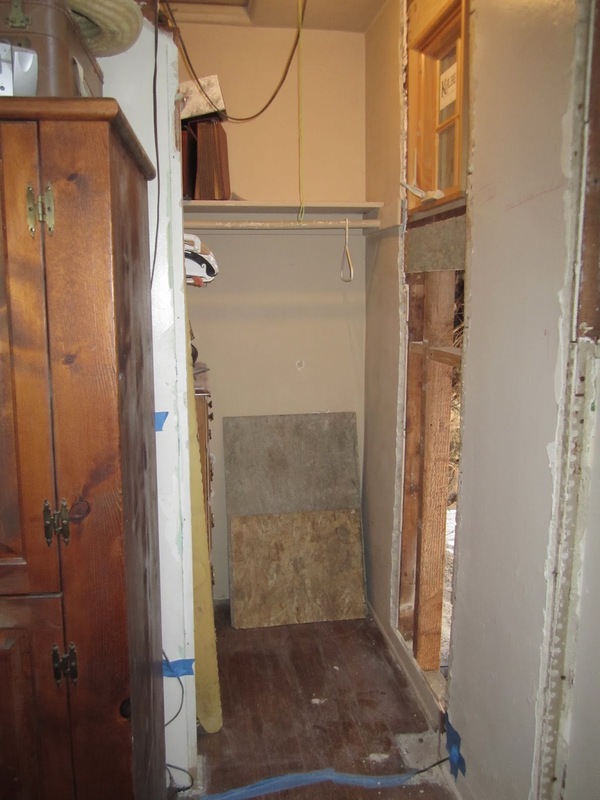 But before I show you the final closet, take a look at these before photos. Woah. Yes, that's a crib in the hallway. It's sitting in the alcove where the laundry is now. That white door led to the "his" side of our old his and her closets. Not bad. But super cramped inside. And I always wanted to make our bedroom feel a tad more spacious. Here's a look at the "Her" side of our closets. At this point, we had just installed that little window up to the left, which later got moved again. See, it's pretty cramped. Hard to find anything in here. Here's a shot of our closet as you walk into the master bedroom. 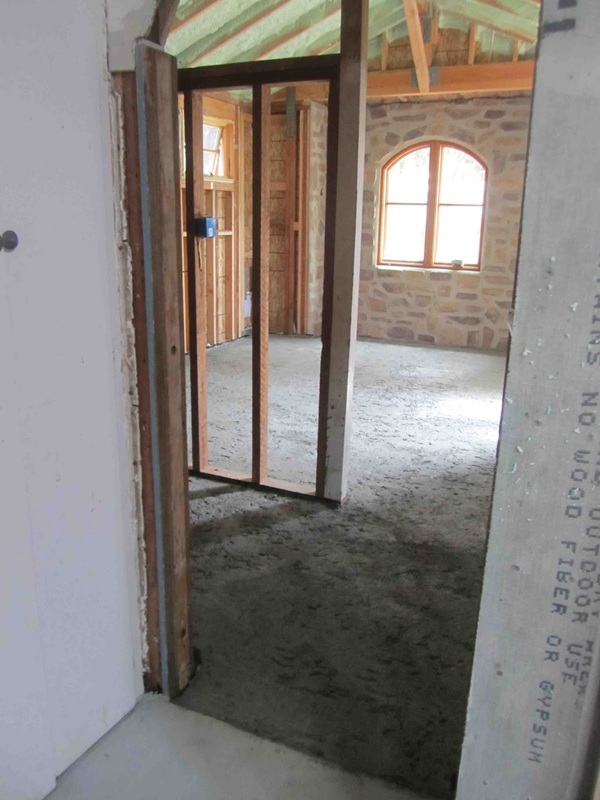 This image happens to show the concrete floors just after they'd been poured and prior to the dry wall. No dry wall on that partial wall. Here's an almost complete master closet. It deviates from our inspiration room a little bit because we opted to use some of the leftover cedar planks for the interior and not plaster them over. The planks smelled so good. 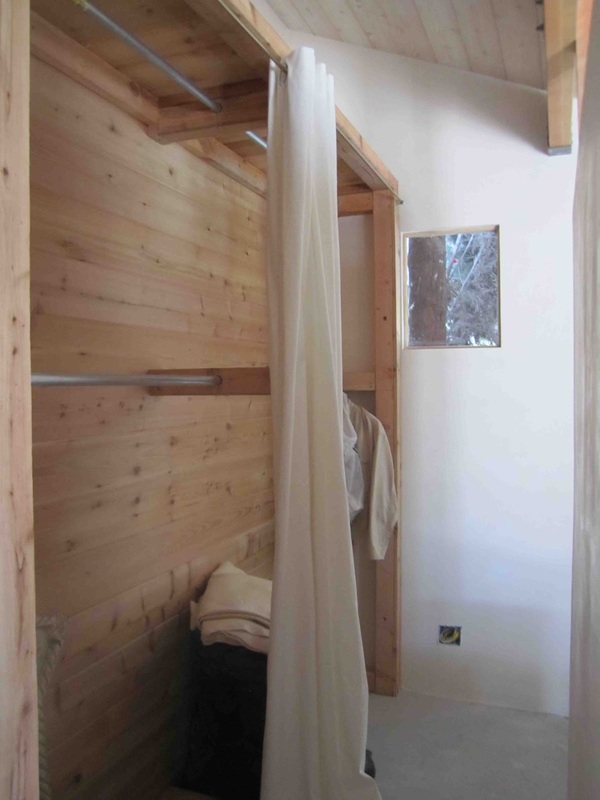 And who doesn’t love a cedar closet? We used some inexpensive piping to make two rods, one upper (for winter clothes) and one lower (for the current season). Scrap wood was used for the rest. A trip to the Container Store and Ikea has given me some great ideas about where to put our shoes, my jewelry and all the other incidentals that don’t get hung up. 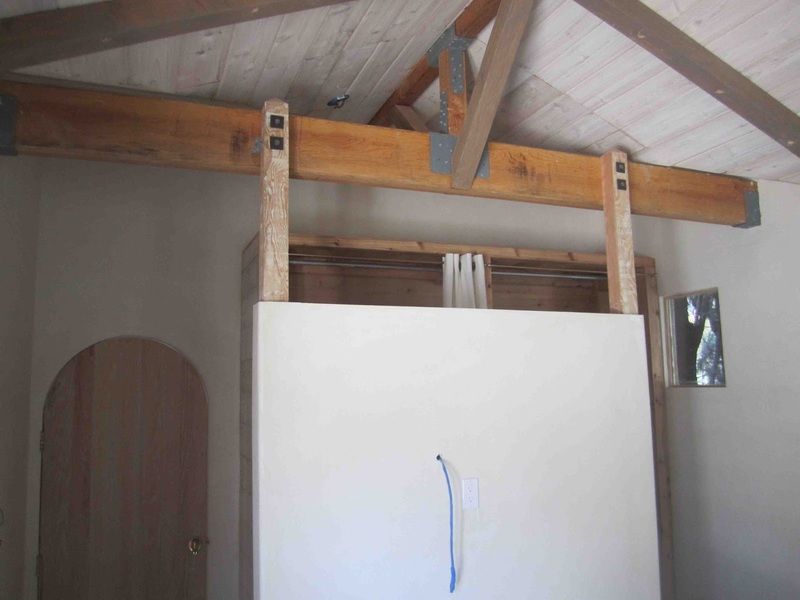 We'll likely use the vertical space on the interior sides of the closet as well. After living in our small guest house with just a drawer for my clothes, I’m ready to get organized (and edit down my wardrobe)! Here's a reminder of what we were going for with our closet design: clean, organic, but rustic. Notice we have a similar, but not exactly the same, partial wall. We still have to polish our concrete floors and we opted to go gray, not white. I was afraid of the upkeep. I did go to the fabric store to price out linen and a linen/rayon blend to recreate the awesome inspiration curtains, but the price was $17/yard, which I thought cost prohibitive. I opted to go with 8 foot long linen curtains with metal grommets from Ikea, which were only $30 a pair. 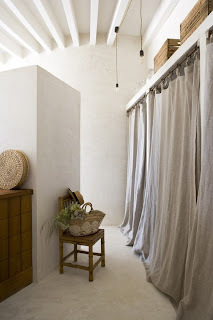 I will probably go with the Ikea linen drapes for other areas of our house as well because the prices are so great. 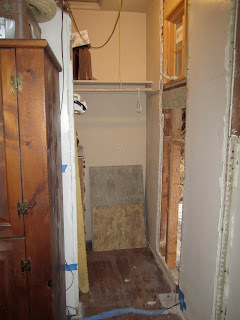 Now I'm switching gears to show you the progress we've made on our laundry nook. I like to call it La Blanchisserie, which I think means "laundry" in French. : ) Concrete floor. White washed cedar plank ceiling. And three layers of Vasari plaster. 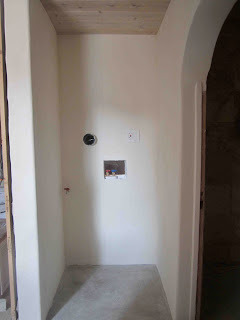 I'll do another post on just the plaster another day, but we are absolutely in love with the look of our plaster walls, which are everywhere (except where there is stone). It's a brighter version of what is called Navajo white (we reduced the recipe by half). Composed of lime, marble dust and fine sand, this plaster is giving the house a beautiful organic look and feel. Beyond aesthetics and no VOCs, the advantages of this plaster are many: it's water-tolerant, breathable, has insulating qualities, absorbs CO2, plus it's naturally resistant to mildew and fungus. And, when it's lightly burnished, it reflects light, which brightens up the entire house. In our old house, we used to have to keep the lights on all the time to see anything, but now we never need to turn on the lights during the day. And here's a tip: washing the walls with a 1:1 solution of Dr. Bronner's Pure Castille Soap and water seals the plaster, making it water resistant with no dusty residue. Here's a reminder of the old area that would become the laundry nook. Look just inside and to the left of this doorway (under the loft space). And voila! Here is the after shot. Our stackable front-loaders fit nicely. 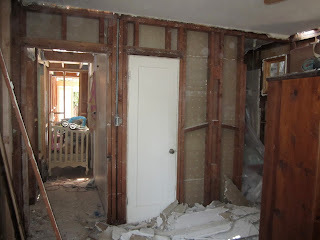 (As a reminder, this used to be the hallway entrance to our daughter's old bedroom. We thought it may be better used for the laundry, which used to block our old kitchen door. And in case you're wondering, they are LG. So far, we're loving this laundry unit as well. Sure beats doing laundry in the garage and at the laundry mat. While we did install sound proofing insulation in these walls here (as well 5/8 dry wall, which is thicker and more fire resistant) because we thought it would be too noisy to have laundry near all of the bedrooms, it is whisper-quiet except for the music it plays when it's done! Pinch me, I must be dreaming.